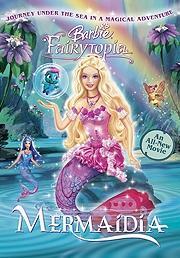 In Barbie's family film Barbie: Mermaidia, the good fairy Alina (introduced in Barbie's Fairytopia) has an exciting adventure in the underwater world of the merpeople. Barbie: Mermaidia is the latest DVD offering from Mattel; the toy maker has launched a series of fairy tale children's movies starring fashion doll Barbie and her friends as the lead characters in each movie. Alina, having finally earned her wings in Barbie's Fairytopia, is chilling in Fairy Land when a sea butterfly flies up and tells her that her friend Prince Nalu, leader of the merpeople is in trouble. He has been kidnapped by the evil Laverna. Of course Alina has to head to Mermaidia to help her friend. In the process, she hangs with another mermaid named Nori, a dolphin named Fin Fin, a turtle named TuTu (yes, really) and a wise snail named Delphine. This reviewer's resident 4-year old loves Mermaidia. It was a no-brainer in our house since she is obsessed with mermaids and is a big fan of the whole Fairytopia universe. And, yes, I've already read the poorly written Mermaidia book umpteen times. The scene in the berry garden is her favorite because it is "tropical and pretty" and includes a hilarious (to the preschool crowd, anyway) scene where Alina's pet puffball Bibble speaks in a deep voice. Second best is when (spoiler coming up, for those of you who care) Laverna gets turned into the ugly toad that her true nature reveals her to be. So, you decided to shell out the $15 to get the DVD? Well, don't close your wallet just yet. There are mermaidia dolls (fairies, mermaids, sea butterflies and all the other characters) mermaidia books, mermaidia clothing, accessories and just about anything else you can imagine. Barbie: Mermaidia is sickeningly sweet, clumsily written and generally sub-par as fairy tale film entertainment goes. Fine multi-layered family entertainment, this isn't. However, that is only the (unimportant) adult perspective. Four to seven year old girls view it as Nirvana on a silver disc, a fantasy world extraordinaire; the ones I know aspire to total immersion in the Mermaidia world. The story is completely appropriate for even young preschoolers making it an ideal family movie for those with girls of multiple ages. So, if you are looking for a movie that will render your resident miniature mermaid or fairy blissful for 85 minutes, the Barbie: Mermaidia DVD is worth every penny.